Elizabeth Anne Wood, Ph.D., is a SUNY Chancellor’s award winning professor of sociology at Nassau Community College, where she has taught since 2000. She earned her Ph.D. at Brandeis University in 1999 for a study of gender, power, and interaction in strip clubs. In addition to her academic work, Elizabeth is Senior Strategist for Woodhull Freedom Foundation, the nation’s only human rights organization working full time to protect sexuality and gender freedoms. 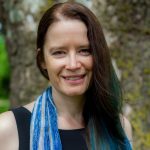 Her first book, Bound: A Daughter, a Domme, and an End-of-Life Story, will be published by She Writes Press in August 2019.